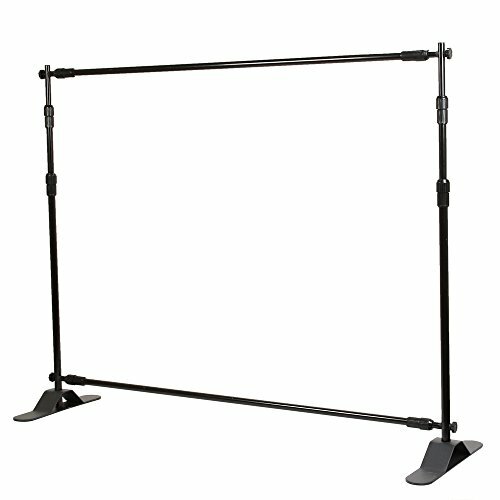 Backdrop Stands are a great display solution when you need a stand to hold a large format banner or when you really need a professional presentation to show off your company at any venue, media event, tradeshow. The black telescopic banner stand can be set up instantly for local fairs, store promotions, exhibitions, conferences, seminars and presentations, by which you can show your ingenious ideas by hanging different dimensional fabric graphics. Display sizes may be adjusted depend on user's demand. The whole stand is lightweight, durable, easy to transport with an soft carrying case. Width range: 54" x 96"
Height range: 35" x 96"
Maximum visible graphic size: 96" x 96"
If you have any questions about this product by Flexzion, contact us by completing and submitting the form below. If you are looking for a specif part number, please include it with your message.